Sequim Hotel's Rooftop Garden Provides Scenic SplendorOur hotel's staff in Sequim, WA is dedicated to making your visit to Washington's "Adventure Playground" memorable. At the Holiday Inn Express Hotel & Suites North Sequim, you'll get more features and perks than you expect.Our conference center is the perfect place to host meetings in the spacious ballroom, boardroom or the rooftop patio. For those traveling to British Columbia or on the way to explore Olympic National Park, the hotel's Sequim, WA location is convenient but seems miles away in its scenic surroundings. With free high-speed, wireless Internet access and a 24-hour Business Center, you can stay productive and connected.While lodging in North Sequim, WA, you'll be surrounded by gorgeous natural green space and mountains. We're close to several of Sequim's lavender farms and the Lavender Festival's many events and tours. Our lodging in Sequim, WA is also close to Dungeness Bay where you can walk along the spit to the lighthouse or golf at the Dungeness Golf Course.Stay with us and enjoy the amenities that add an extra special touch. 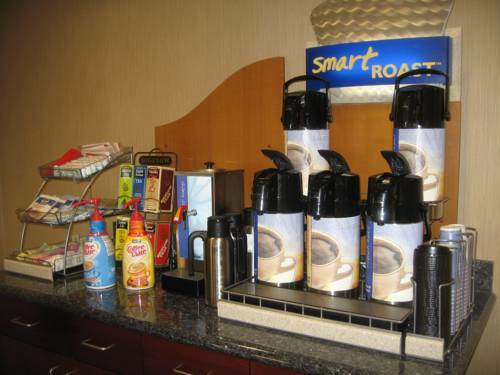 Start your day with a fresh, hot meal with the free Express Start Breakfast Bar. Relax in the large pool or get a great workout in the Fitness Center while enjoying the beautiful views of the valley around you. Make your next conference or special event memorable at the Holiday Inn Express Hotel North Sequim, Washington. Black Bear Diner: Down home chain serving all day American comfort food and desserts in a woodsy setting. Downtown SequimBe sure to visit Downtown Sequim to browse through a variety of locally owned, unique stores. Cedars at DungenessPar 72 Championship Course. A nice blend of long open fairways and tight bunker lined greens. Signature hole is #3, the par 5 "Old Crabby" (516 yards). 7 Cedars CasinoA full service casino with slots and various table games as well as a poker room. The Casino also features 2 restaurants and a Deli counter. Lake CrescentA beautiful crescent shaped lake filled with water from the Olympic Mountains has been the setting for movies and a favored spot for Presidents, especially Roosevelt. Sunland Golf CourseA private golf course that has narrow fairways and lots of bunkers. This course has only recently opened its doors to the public, having been a popular residential course for many years. Port Angeles Underground TourVisit the history of Port Angeles with a unique guided tour under the city streets.